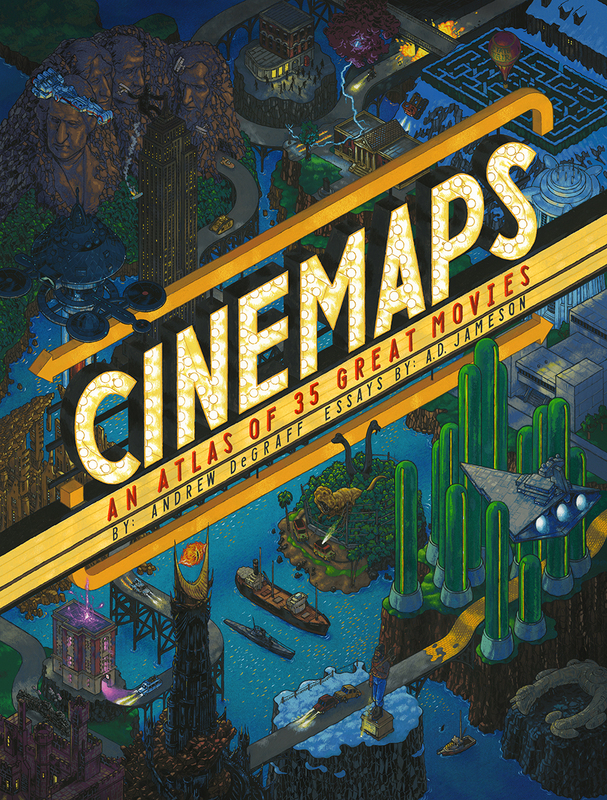 “`Cinemaps: An Atlas of 35 Great Movies is from Quirk Books. This beautifully rendered atlas is an essential reference for anybody who loves modern art and great motion pictures. 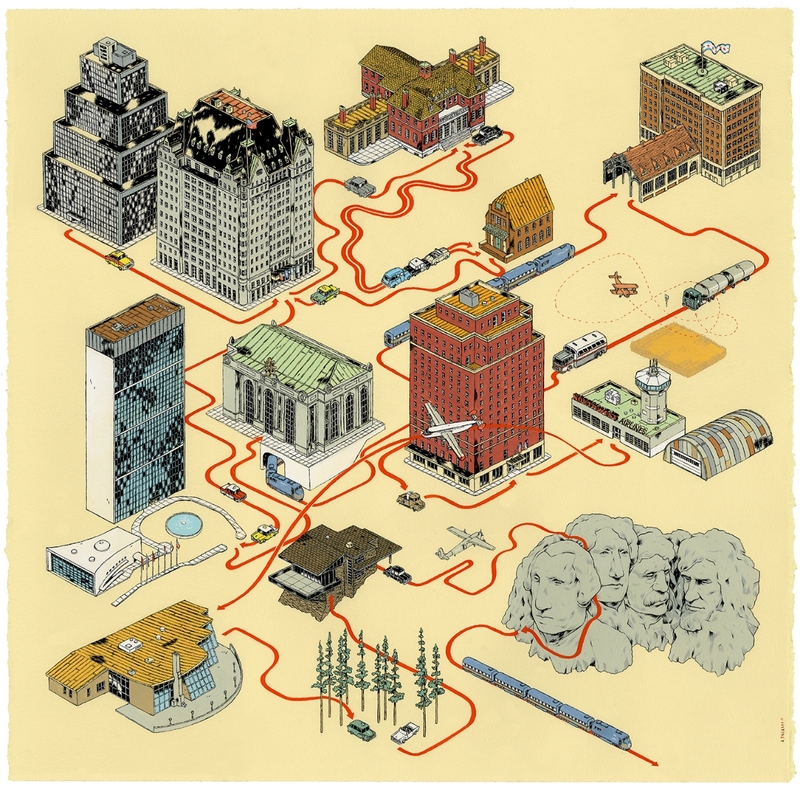 “`Esteemed artisan Andrew DeGraff crafted hand-painted maps of seminal movies, such as King Kong, North by Northwest, Jaws, Ghostbusters, The Princess Bride, Raiders of the Lost Ark, Fargo, Pulp Fiction, The Shining, and The Breakfast Club. Each of the routes of major characters are charted in meticulous cartographic detail. “`Andrew DeGraff is a freelance illustrator and artist living and working in Maine. Andrew was born in Albany, New York. In 2001, he graduated from Pratt Institute’s Communications Design program. 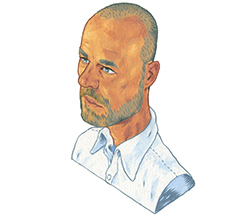 His clients include Visa, Sports Illustrated, Kellogg’s, New York Times, and GAP Kids. His gallery work has been shown in New York, Chicago, Calgary, Honolulu, Philadelphia, Albany, San Francisco, Los Angeles, Mexico City, and Quezon City in the Philippines. DeGraff (right) sketches unique points-of-view. “`Each map is presented in an 11-by-14-inch format, with key details enlarged for closer inspection; and is accompanied by illuminating essays by movie critic A.D. Jameson, who provides written commentary about the unique geographies from each flick. “`My personal favorite is the trek made in the Alfred Hitchcock 1959 classic motion picture. This entry was posted on Tuesday, November 7th, 2017 at 9:00 pm	and is filed under Blog by Manny Pacheco. You can follow any comments to this post through the RSS 2.0 feed. Responses are currently closed, but you can trackback from your own site.